A few months ago, we released our first feature in our Reality Simpsons Study, depicting Homer as he would appear if he were a real person. The purpose of this creative study was to find a happy median between the anatomical proportions of the cartoon characters and those of real human beings. While some were intrigued, others were offended by the monstrosities resulting from our transformations of the entire family. However, everybody appeared to be creeped out, if not horrified by the ‘Simpsonoids’. Ignoring the creative purpose of the study, many die-hard fans protested the original Homer creation, stating that it did not accurately depict him. While it is not our role to satisfy cry babies, their cries did catch our creative attention. Enough so, for us to create a definitive digital depiction of Homer as a real person, replicating the actual features and proportions of the original character and thus, abandoning those of our fellow real-world humans. 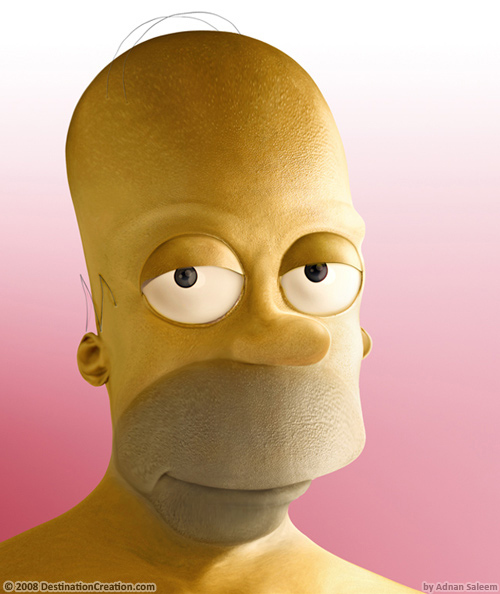 The following study presents the creation of Homer Simpson, in the flesh. Somehow this is easier on the eyes then the more human attemt. I supect this is a good example of the “uncanny valley” effect. Wow… Why can’t we leave The Simpsons just as they are… cartoons??? Seriously! Some things just aren’t meant to be fooled with. I think it would be cool to see a computer animation like that, but not so much the human things. If they could figure out the rest of the characters, up-to-date shows for the kids today, and the parents can still relate! I have to go with Janice here. Let’s just leave them alone. We can replace voice actors. Maybe we need a premise of how human there aloud to look. I would be happy with just a few seasons of 3-D Homer. Janice, shut up. it’s people like you that ruin this country and creativity. It’s pretty interesting. The emotional displays are too subtle, though. You guys forgot that when Homer is “lustful”, he actually sticks out his tongue and drools with his head back ?!?!?!?!? Kinda reminds you the episode “Treehouse of Horror VI?” The last toon that has Homer wandering off into the Tron-like dimension??? Guess you must be taking this another step further! Omg! I thought that was so cool! I think it’s unbelievable how you guys can actually turn a real photo into something so… fake-ish. It’s amazing, like alot of your other videos. Keep up the good work people! i think the majority of the look were kind of the same don’t you think? but that was an amazing job so well done!!! Nice. Thanks for this. Is there an easy way to subscribe to comments here? This one is definitely better than the other ones!!! I love it! it looks son real!!! Excellent job!! The nose is to long, otherwise, wicked. I think he looks almost like the cartoon homer but he does looks a little weird looking. I really think thats cool! I wonder how they do that? !